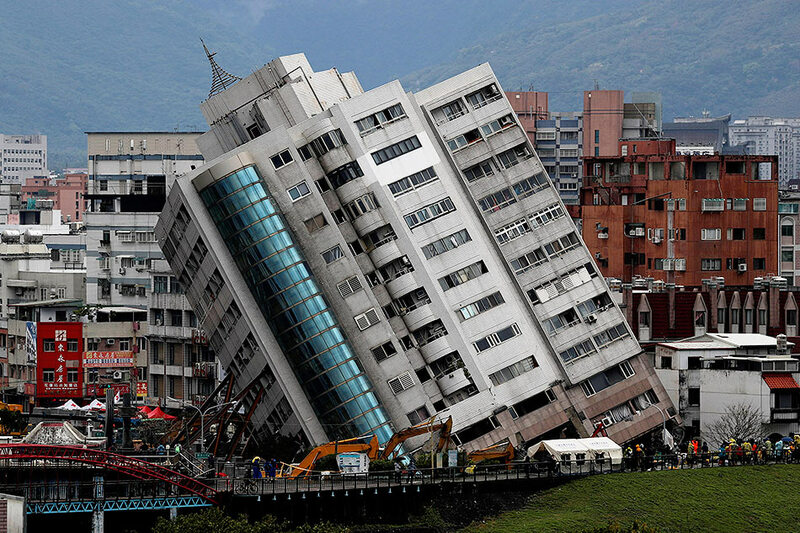 Taiwanese rescuers Thursday braved aftershocks coursing through a dangerously leaning apartment block that was partially toppled by a deadly earthquake, as their search for survivors uncovered three more bodies. At least 10 people have now been confirmed killed by the 6.4-magnitude quake that struck the popular eastern tourist city of Hualien on Tuesday -- five locals, four Chinese mainland nationals and a woman from the Philippines. But authorities dramatically slashed the number of missing from more than 60 people to seven by Thursday evening -- five Chinese mainland nationals and a Canadian-Chinese couple. The powerful tremor left a handful of buildings badly damaged -- some of them leaning at precarious angles -- as well as roads torn up and hundreds forced to shelter in local schools and a stadium. The major focus for emergency responders remained the Yun Tsui apartment block which also housed the Beauty Stay Hotel on its lower floors. Seven of the dead perished in that building and the remaining missing are believed to be hotel guests there. The lower floors of the 12-storey tower pancaked, leaving the structure leaning at a fifty-degree angle and sparking fears of an imminent collapse. Despite those risks rescuers kept going into the building in a desperate search for survivors. But Thursday's search only recovered three bodies -- a Chinese mainland tourist, a local hotel worker and the Filipina. Strong aftershocks continued to strike, sending the teams scurrying from the building, only for them to return a little later and resume their grim task. An emergency responder surnamed Lin said it took 14 hours to free the body of the hotel worker, who was partially trapped between the hotel's ceiling and floor. "We saw his hair and were digging for some time," he told AFP. All the while they could hear the victim's mobile phone ringing, he added. The man was later brought out in a white body bag. A Red Cross worker at the scene estimated that the building had tilted another five percent overnight, adding he had little hope of survivors being found on its lowest floors. "Floors one to three are all compressed so it's hard to tell whether there are people," he told AFP, requesting anonymity. He said that there was no risk of a gas explosion in the building but the aftershocks and further slippage remained a persistent danger. Hualien is one of Taiwan's most popular tourist destinations as it lies on the picturesque east coast rail line and near the popular Taroko Gorge. But the mountains that rise up behind the city -- and bestow Taiwan's east coast with such majestic beauty -- are a testament to the deadly tectonic faultlines that run through the island. The government said 16 foreigners sought medical treatment for minor injuries. Local broadcaster SET TV ran an interview with a man who said he was the husband of one of the mainland Chinese victims. The woman, named as 39-year-old Yu Fei, was travelling with the couple's young son on the island. The son survived the quake with light injuries. She was pulled from the wrecked building and later died in hospital. "They were travelling on their own as I was busy and couldn't accompany them," the man, who had rushed from the Chinese city of Xiamen, said. "I got in touch with my son, he cried." President Tsai Ing-wen visited survivors on Thursday, many in tears. In a Facebook post she praised emergency responders. "Rescuers on the scene and hospital staffers continue to dedicate themselves fully to the rescue works," she wrote. "Stay hopeful and never give up." The Hualien quake came exactly two years to the day after a similar sized tremor struck the western city of Tainan, killing 117 people. Most of those who perished died in a single apartment block which collapsed. Five people were later found guilty over the disaster, including the developer and two architects, for building an inadequate structure. The island's worst tremor in recent decades was a 7.6-magnitude quake in September 1999 that killed around 2,400 people. That quake ushered in stricter building codes but many of Taiwan's older buildings remain perilously vulnerable to even moderate quakes.